A teacher beat a student after a student threw a desk at him. 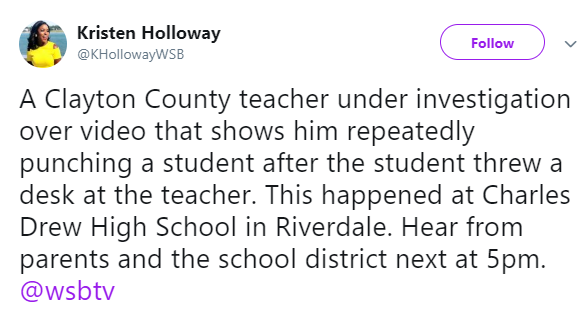 A Clayton County is currently under investigation after video of him beating another student surfaced online. The video is currently going viral. The students in the classroom reported that the student threw an entire desk at the teacher. The teacher then proceed to retaliate by approaching the student and fighting him. The teacher got him to the floor and repeatedly started punching him. The incident happened at Charles Drew High School in Riverdale. WSBTV reporter Kristen Holloway reports that the student’s parents will be given an interview at 5pm. New York man sentenced to 8 years in Jail for Beheading & Dismembering woman he met on Dating app in Japan. Muslim groups have raised enough money to cover All Funeral costs for all Pittsburgh victims.